Portrait in profile. Studio A. Krivitsky. School portrait experimental photograph A. Krivitsky. Portrait. 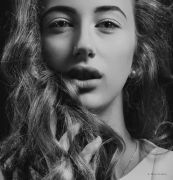 The course of emotional portrait in school A. Krivitsky. Portrait - Joke. Experimental School of Photography A. Krivitsky. Portrait. Photo tests. Fashion model. Special location A. Krivitsky. Genre portrait. A fashion model in one of the styles of modern presentation ... A. Krivitsky. Portrait. Glamor. Fashion model. Studio experiments in the secret studio A. Krivitsky. Glamorous portrait. Plener. Mobile studio A. Krivitsky. Пародист Дима Черников Portrait. Studio A. Krivitsky. Portrait. Light and shadow. School A. Krivitsky. Portrait of a Fashion Model. Studio A. Krivitsky.